Does your window hardware have several coats of paint on it and the locks or latches are broken or worn out? Spring is a great time to update the hardware on your windows. Window hardware includes anything that makes the window function properly and includes sash lifts, locks, stays, slide bolts, cremone bolts, and pulleys and cords. Window hardware varies based on the type and style of window. There are basically seven types or styles of windows. 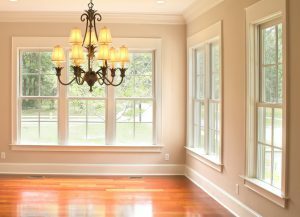 1 – Single and Double Hung Windows are a traditional design where the sash is raised and lowered in a frame. In a single hung window only the bottom sash moves, while both sashes are movable in a double hung window. These windows are taller than wider. 2 – Casement Windows are windows that are hinged on one side and operate using a crank. These windows were popular in the 1950’s and have a resurgence in recent years. 3 – Awning Windows are hinged on the top and are usually wider than longer. 4 – Stationary Windows are a fixed window that does not open. Large picture windows are a type of stationary window. 5 – Sliders are a contemporary style window that slides horizontally. 6 – Transom Windows are small hinged windows over a door that operate with lever or crank system. You can find our blog on this iconic window by clicking here. 7 – Bay Windows are a bowed style window that protrudes out. It usually has a fixed center window flanked by double hung windows. The inside of the bay often has a window seat or bookshelf. Windows are made of wood, vinyl, aluminum, and newer composite materials. Sash Locks and Latches are used on single and double hung windows to secure the sash and help keep it tightly closed. Hook style sash latches are simple two-piece latches that have a hook-like mechanism on the one sash and a rotating lever on the other that hooks onto the other piece to hold the sashes together. 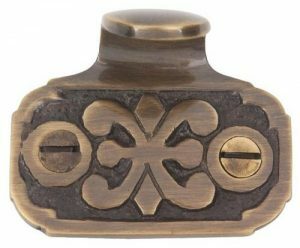 This popular sash lock comes in a variety of finishes and styles from traditional to Victorian. Another popular sash lock is the Casement Latch with Lever Handle that operate like a cabinet lock with a lever-action slide bar that fits in a groove. 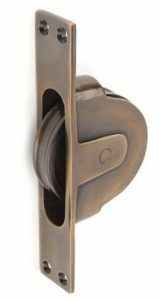 This style latch is ideal for casement or double hung style windows and offered in many materials, styles, and finishes. Sash Lifts are handles that allow for easy opening and closing of the window sash. Styles of lifts include handles, recessed and fingertip. 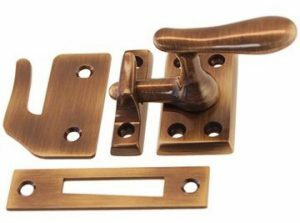 Like Sash Locks, Sash Lifts come in many sizes and styles. An Eastlake or Victorian Sash from Van Dyke’s is perfect for your vintage home or to a dd a period look to new construction. Pulley and cords are used on many older style windows to raise and lower the sash. Van Dyke’s has the hard-to-find Solid Brass Sash Weight Pulley. It is used with sash cord and weights for keeping a single or double hung window open. Window Stays are adjusters that allow the window to open to a fixed distance. Van Dyke’s Iron Window Stay is used on large, heavy windows and has holes for holding window open at four set positions. The rustic iron stay is finished in black and ideal for rustic, country or Spanish style homes. Others models are available in solid brass with Bronze or Polished Brass finishes. Cremone bolts are used on double windows and allow the user to activate two separate locks at the top and bottom of the window with a single handle. Some buyers use a set on one window of a pair and a slide bolt lock on the other, while other buyers prefer to use a cremone bolt on each window.